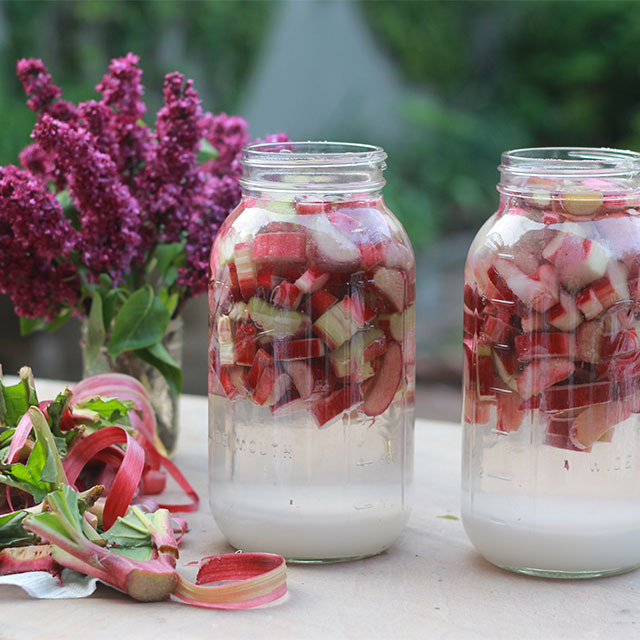 It's hard to ignore beautiful rhubarb. So, when I found some, I chopped it up, covered it in sugar and water, and waited. Then I found some spruce tips (whose flavor is very lemony) and I added a few. 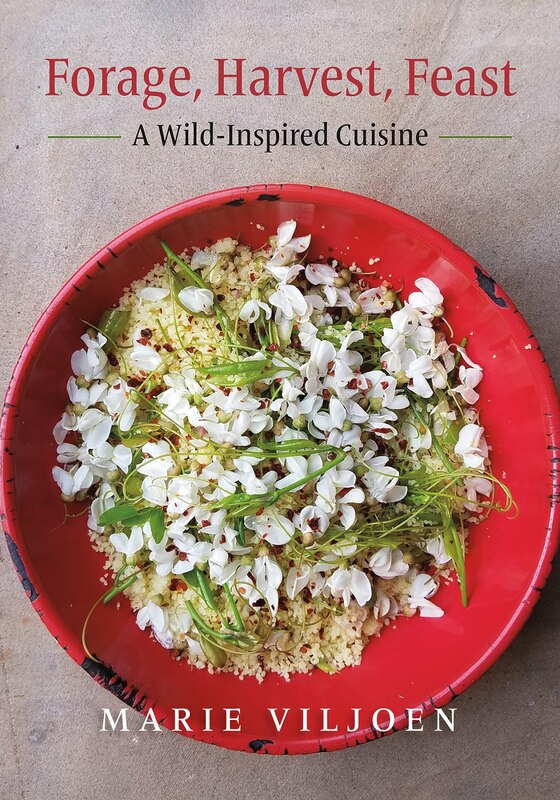 My aim with these fizzes (milkweed, honeysuckle, elderflower, pine tip, autumn olive flower - the list is growing) is to make a concentrated drink that will be diluted, later, with water, seltzer, gin, Tequila - you name it. The fizz is a mixer, a messenger from a moment in a season, caught in a bottle. 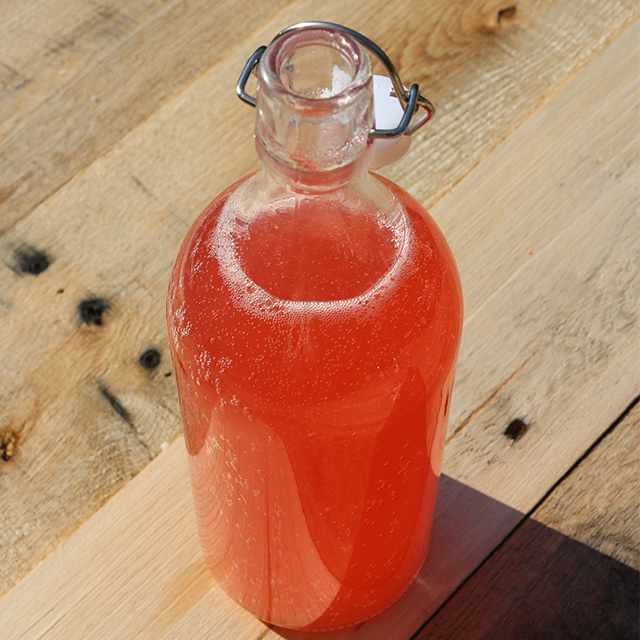 I decided to strain and bottle it, fizzless, with a teaspoon of lemon salt (citric acid). Then, about two weeks later, on a routine check of all my bottles, it fizzed when I eased open the wire top cap. Wild yeast fermentation is not - in my experience - a precise science; at least, without equipment to measure every stage, it is not. These bugs be alive, and they behave according to the wiles of weather and sugar and temperature. I do realize that the more sugar I use the more volatile the fizz - yeast feeds on sugar and burps carbon dioxide. By all means, experiment with less sugar. Some botanicals are more active than others. Flowers are fastest, they seem to hold the most yeast. Be clean. Clean hands, clean equipment. 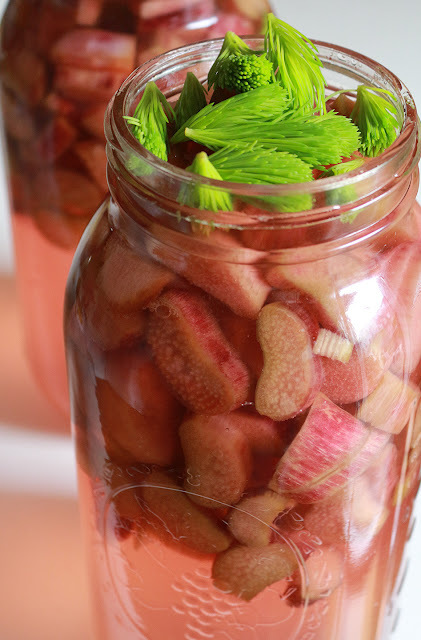 Put the raw, sliced rhubarb into clean glass jars (I used screw-top jars with an 8-cup capacity). Add the sugar, and cover with water. Screw the lid on tightly. Gently tip the jar back and forth until the sugar has dissolved. Loosen the lid again, and leave at room temperature. Check on it every day, stirring it with a clean, long spoon. Do not seal tightly. Screw the lid on loosely, or in a wire top jar either burp daily or secure double layers of muslin over the top of the open jar with a rubber band (to allow air in and keep fruit flies out). At this stage the ferment actually needs air. Yours may begin to ferment before mine did. * I added the spruce tips after about 4 days. But when it is deep pink, after about 6-9 days, strain through a fine mesh sieve into a clean bowl. Strain the liquid again through double-folded cheesecloth. Stir in 1 teaspoon of citric soda for every liter of pop. Decant into a clean bottle. I use a wire top bottle with 1 liter capacity. Plastic is safer if you are nervous about possible explosions - the plastic bulges out when overcarbonated, giving you a very good clue that it wants to blow. 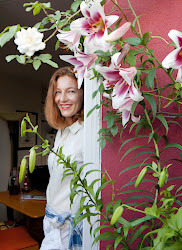 * I have also kick-started fizzless infusions with a slurp from an active ferment (I find any flower infusions to be very active) - but that assumes you have another one on the go at the same time. Store in a cool cupboard, OR the fridge (this is the safest, in terms of slowing carbonation down, but most space-consuming). If not in the fridge, check the bottle once a day by easing the lid open. As I learned (from Pascal Baudar) after an autumn olive flower eruption, you keep the left hand very firmly on the wire top lid, while easing the wire stopper loose with your right. This way you will hear the hiss - if there is one - very soon. If it hisses, allow the gas to escape very slowly by keeping your left hand firmly on the lid and releasing gas very slowly. Keep an eye on the bubbles. If they threaten to froth out, clamp the lid down tightly until they subside. Then begin again until no more gas escapes. It's tense, and better than TV. Repeat daily. If you keep the bottles in the fridge this process is greatly slowed down. But who has the space? Still, peace of mind and all. An exploding glass bottle is potentially disfiguring. Many of my other fizzes have kept well at room temperature for a year or more, sans burping, without accident, but before, I used less sugar. More sugar means more concentration, for me, and more dilution. So more mixing power. But more carbonation. What a refreshing cocktail this will make, with a good slug of gin and a squeeze of fresh lime!